Review: The MB&F Black Badger HMX with added glow power! With our hands-on analysis, comparative study, musings and high magnification photographs. Unique and very beautiful golden bridge movement. Classical and elegant. Nicely finished case and movement. 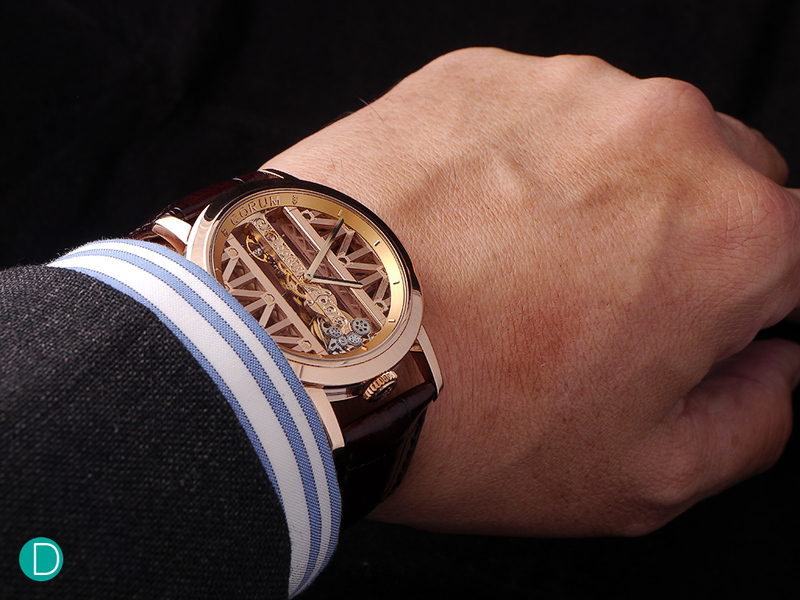 Dilutes the unique value proposition of the Golden Bridge with the round case, which makes it just another round watch. The elements of the Golden Gate Bridge on the sides of the movement may give the impression that the dial is busy without a clear message coherent with the movement design. Beautiful effort by Corum. Great looking watch. 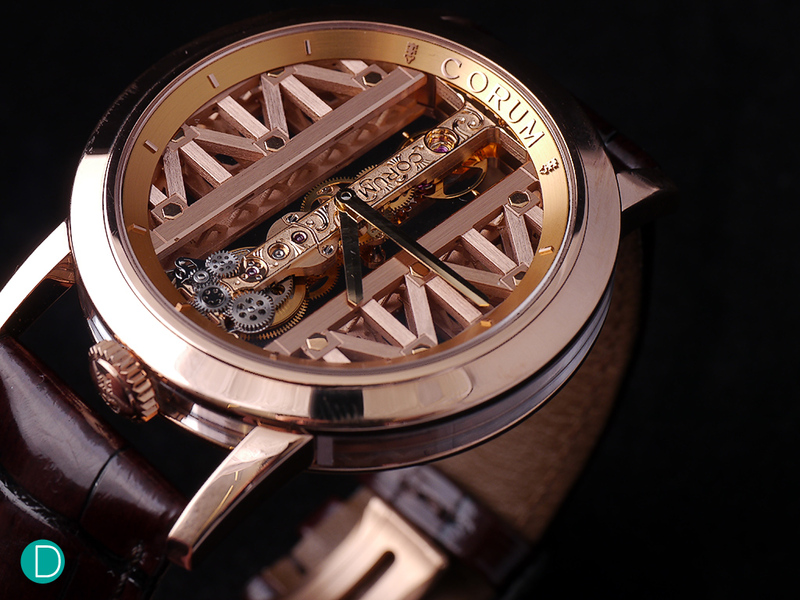 One of the watches Corum is famous for is the Golden Bridge. We covered a review of the classical Golden Bridge here and a ladies perspective on the ladies version here. We found it to be a charming watch, full of character. The classical Golden Bridge follows the form of the movement with a tonneau shaped case with sapphire glass on all sides. They did a foray into a round case with a limited edition run of 75 pieces in 2010, but have kept the tonneau shape. Till Baselworld 2016, where they launched the Golden Bridge Round, with inspiration from the Golden Gate Bridge in San Francisco. 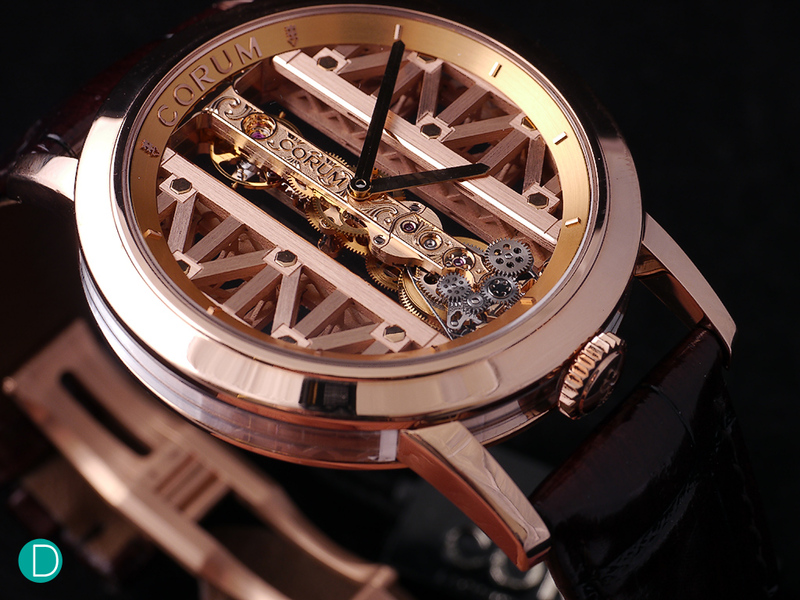 The classical Corum Golden Bridge is housed in a tonneau shaped case. The movement is the iconic design of Vincent Calabrese in the early 1980s. Corum has been producing the watch in its various case materials since. But always the timeless movement is encased in sapphire glass all round for all to admire. While this may not be a technical feat these days, some 35 years ago, when it first burst into the scene, it was considered a technical marvel to be able to showcase the movement like that. The design seem to be able to transcend the technical side of watchmaking and bring it together with the artistic. In 2010, Corum made a special 75 piece Limited Edition of the iconic C0113 baguette movement in a round case. This was encased in a round rose gold case, and was retailed for US$25,000. The case size was then 41mm, and a black dial with vertical guilloché. The new 2016 Round Corum Golden Bridge has the movement inside a scaffold design which is inspired by the Golden Gate Bridge in San Francisco. Two versions are available. The 5N Red Gold Golden Bridge Round which we review here. And a diamond set version in white gold. Corum Golden Bridge Round. The design on the sides is inspired by the Golden Gate Bridge in San Francisco. The case is now 43mm in diameter, and some 8.8mm thick. The case material is 5N red gold, but it could also be described as two pieces of sapphire glass, a cylinder made of sapphire glass held together by two bezels (front and back) and lugs made of red gold. The open design of the case, with sapphire all round allows a great deal of light into the movement, and for it to be proudly visible from all angles. This aspect is quite magnificent. Corum Golden Bridge Round. Visible is the sapphire glass as the case sides which allow light into the movement. The dial is a design which mimics the Golden Gate Bridge, with the rising trusses from which the cables hang to carry the road below. We find that the design to clutter the face of the watch, and the Golden Gate Bridge story is weak and not coherent with the overall branding story of Corum and the Golden Bridge. Other than the stylized Golden Gate bridge on the sides of the movement proper, the dial is a ring with raised hour markers. 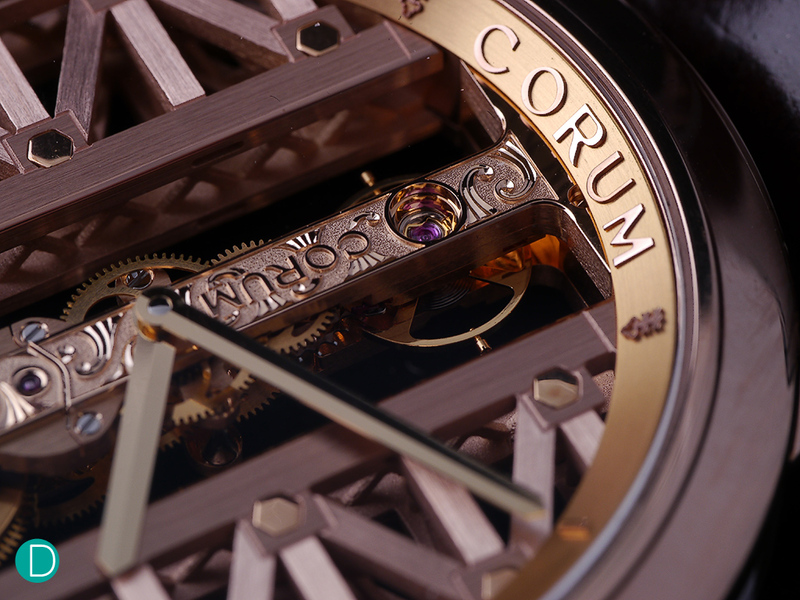 At 12 o’clock is the word “CORUM” framed by two small keys which are also Corum’s log. We think this is a nice detail. 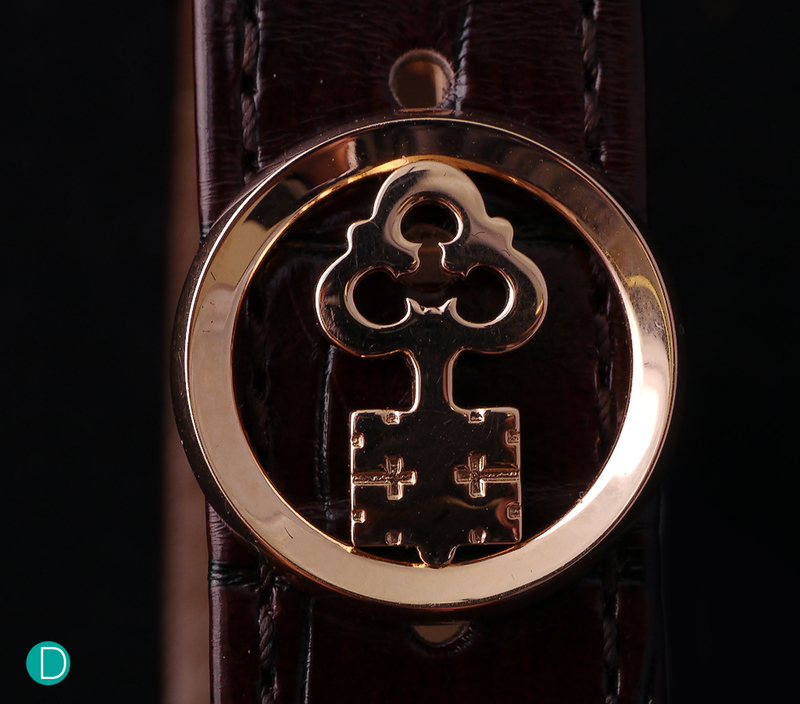 The key is also found on the butterfly styled deployant buckle. The Corum key logo is a small but beautiful detail on the clasp closing the butterfly deployant buckle. To us this is the star of the piece. The baguette movement is still unique some 35 years after its original creation. And remains largely unchanged in all the Golden Bridges that Corum has made since. And for good reason. No need to mess with perfection. From the caseback, the motif of the Golden Gate Bridge is more clearly discerned. The technical specifications of the movement is quite standard: 28,000 bph, 40 hours of power reserve. But the linear design is quite inspiring. Unlike the twists that a typical wheel train is made to go through to make full use of the case, the C0113 has the train’s wheels arranged in a straight line, from mainspring to the escapement. The crown is directly attached, via a series of transmission wheels to the mainspring at 6 o’clock. The transmission wheels which transmit the winding power from the crown to the mainspring barrel. Also visible is the keyless works which is used in time setting of the hands. Movement finishing is quite beautifully done. While the movement and the Golden Gate design is not anglaged, the movement is nicely polished. The C0113 itself has beautiful, and tastefully restrained hand engravings on the bridge itself. On both sides of the bridge, there is a polished lip which is slightly raised, while the face of the bridge has a textured decorative finish, with relief hand engraving. 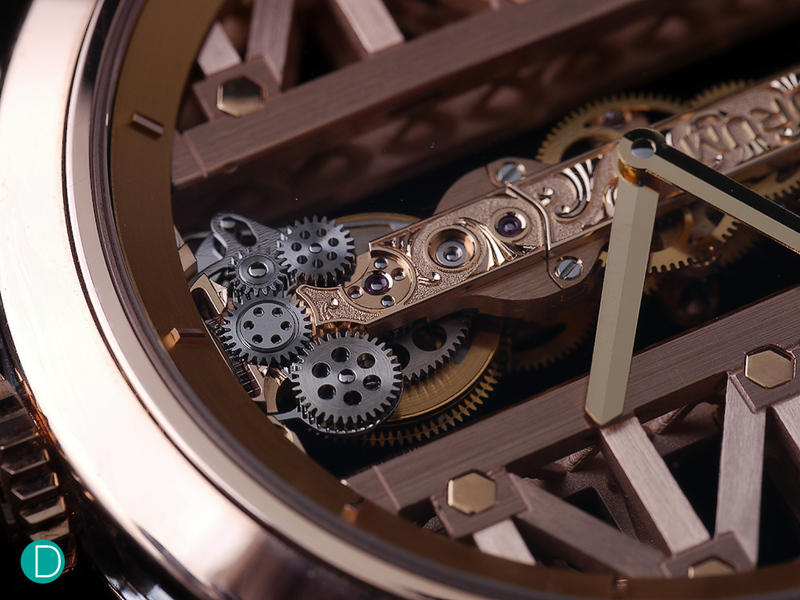 The bridge is made of 18ct rose gold, it stands proud and beautiful. The hand engraved bridge, showing the brand logo is done in relief engraving. As are the decorative swirls on the textured face of the bridge. The sides are somewhat raised and polished. The 18ct red gold bridges are a characteristic beauty of the movement, as it gleams in the light, and is quite a beautiful sight to behold. Corum Golden Bridge Round in red gold, in a red gold case, red gold movement plates. This is quite a unique watch. The linear baguette shaped movement is unique. Perhaps the only comparison is to Vincent Calabrese‘s bespoke peices, where the client can request for the shape of the movement to be in any shape he wishes, be it a letter, or map. These pieces can still be commissioned from Vincent, and presumably a linear baguette shaped movement, say in the shape of the letter capital I, may be designed to look similar. However, Calabrese cases are only available in one size and design, and a case where all sides are in sapphire glass is not one of the offerings. Our friends at Watchonista has an interesting article on Vincent and his creations, click here for the article. We see no other candidates in the competitve landscape. Of course, there are alternative watches one can buy with the same money, but that opens the field to every watch within the CHF45,000 to CHF55,000 price range, and is outside the scope of this review. 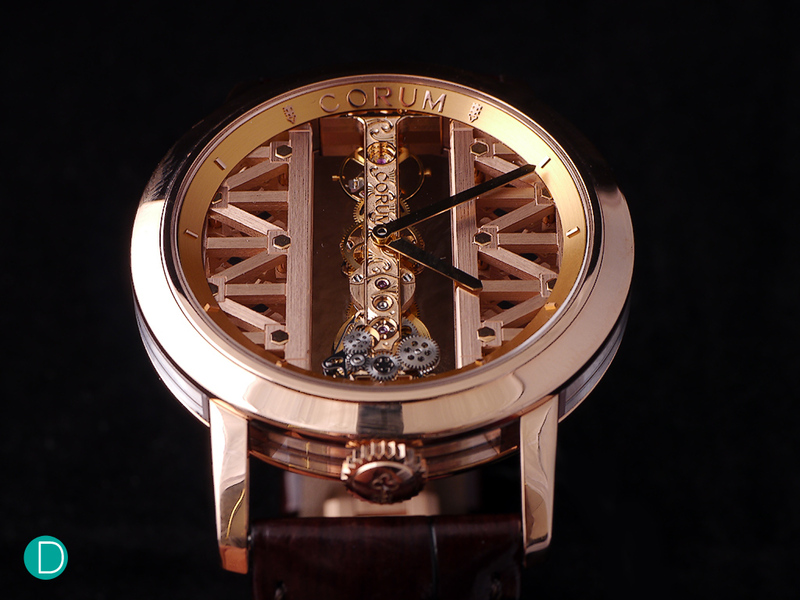 The Corum Golden Bridge Round is a very beautiful watch. We might have been bothered with the linkage to the Golden Bridge, and the additional clutter the design brings to the dial, but we cannot argue that despite that, it remains quite beautiful on the wrist. And at 43mm it wears well. at 43mm, the Golden Bridge Round wears very well. We love the movement, have always loved it, be it be encased in a tonneau case, or like it is here in a round case. We loved the little details like the relief engraving on the bridge. Like the little key logos flanking the Corum brand name on the dial. Its a very pleasant and refreshing take at a watch. But we fear that by taking this path, Corum may have unintentionally ditched their unique sales proposition of the baguette movement in a baguette or tonneau case and make the Golden Bridge just another round watch. That would be a tragedy. We hope not. 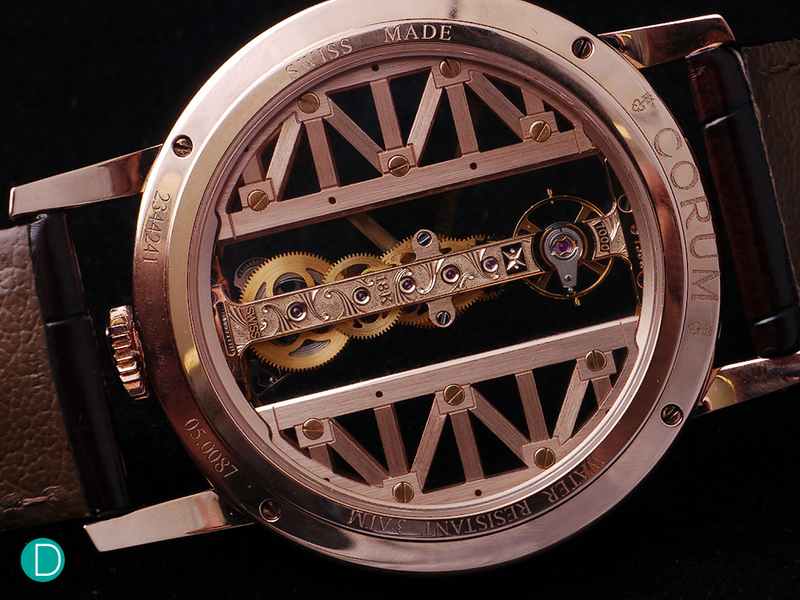 We hope Corum will continue to make the classical Golden Bridge watches. Viva la Corum!